Over the course of more than 100 years in business, St. Louis, MO-based SEMCOR has built a stellar reputation for supplying high-quality fluid and material handling products for a broad range of applications. Our customers also get access to superior fabrication services and prompt, attentive support. Gangways are ramp-like structures that serve the function of a bridge between a loading platform and a rail car or truck. As such, they can be indispensable pieces of equipment for tasks such as loading, unloading and inspecting. 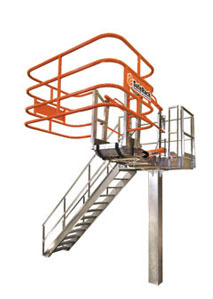 Depending on the application, gangways can be flat, offer telescoping capabilities for raising and lowering as needed, or even take the form of a self-adjusting set of stairs. As part of our ongoing efforts to supply only the best fluid handling products to our customers, SEMCOR is proud to offer the latest, most innovative and safest gangway products from SafeRack. You will find an assortment of truck and rail car gangways and bridges that are built to withstand the rigors of heavy use. We also provide complete technical support for all SafeRack gangway products. Browse our current in-depth gangway offerings and feel free to contact us if you need additional product literature or other information. Our sales and service team is also available for a customization consultation if needed.